Are you in pain that you feel no one can help with? Do you settle & think that being in pain is an acceptable process of getting older? Do you want to understand why you're in discomfort and how to get rid of it? Moveology has the tools, which you can implement immediately and get results and return to pain free movement. Let us help you to get back to the better and more powerful version of you. Come and see Moveology on Thursday 28th March at 7:30pm in the business suit in David Lloyd Swindon. 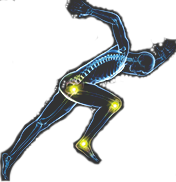 We will show you how we use the science of total movement, osteopathy and biomechnics to get you back in business. Book at reception in David Lloyd or email: [email protected] quoting 'movetalk' in subject line.